Significant design flaws and poor quality make this a product to stay well away from. I was so amazed at the poor quality and design of this UnderQuilt when it arrived, I shipped it back to Backcountry.com the next day. First, if you looked at Arson's review with the video, let me say the unit I got no longer has the shock cords running along the length of the sides. The only connection points are the two ends. Arson's video convinced me to try it; what arrived was mailed back after a test in my cold garage. I bought this because I won Trailspace's contest in January 2013 and got a $500 gift card to Backcountry.com (Thank you, Trailspace!!!!!). I needed an underquilt for my hammock, and Backcountry only sells the Ember. 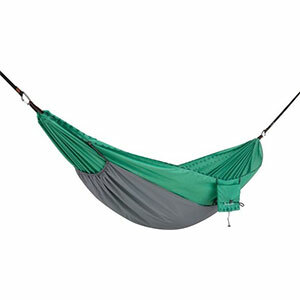 I was warned by MANY folks on Hammockforums.net not to buy it, but I had the gift card. The first thing I noticed when I opened the box was that the Ember had the feel of one of my kid's $15 Walmart sleeping bags. It just felt cheap—but at $174 it cost a lot. 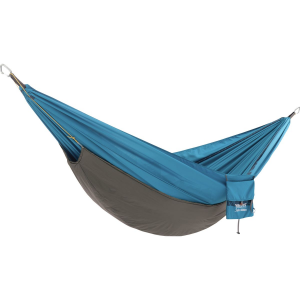 I set my hammock with the Ember up after work, and I was further disappointed. An UQ is suppose to hug up against the bottom of the hammock to trap warmth. Unfortunately, there were so many gaps—gaps that the design of the unit prevents from closing—that the Ember was full of cold spots. I was uncomfortable laying in my 60°F garage. There's no way I'd take this out on a cold night. I packed it right back up and contacted Backcountry about exchanging it for something else. Very disappointed, but I had been warned. Here's my review of Eagles Nest Outfitters "Ember" underquilt. A high quality, well engineered, lightweight, reasonably priced solution for keeping warm and cozy during cool nights in a hammock. Highly recommended for backpackers, cyclists, and rowers desiring a warm and comfortable multi-season hammock sleep experience. Compression straps would be a nice addition to the stuff sack. I am new to hammock camping after vowing to no longer crawl around on the ground and suffer the slings and arrows of rocks, twigs, bumps, lumps, uneven terrain, sore backs, and floods intruding on my former ground sleeping experience. Hammock camping offers most people a totally new type of outdoor sleep experience that offers comfort and expanded options in selecting a non-traditional campsite location not requiring a perfectly flat, level, and dry location. OK, that is the good news. There is a potential downside to hammock camping that is however easily remedied. Hammocks can be cold when temperatures start to dip below 60°F (15°C) overnight, especially on one's backside. A conventional mummy type sleeping bag is too compressed between your back and the hammock to offer much insulation value and it is very awkward to try to ingress and egress a hammock while ensconced in a close fitting sleeping bag. Adding one's existing sleeping pad can boost the insulation factor but most sleeping pads inevitably start moving around overnight and need to be constantly repositioned underneath oneself. For those reasons, hammock underquilts provide a warm and cozy night's rest without the drawbacks of conventional sleeping gear. 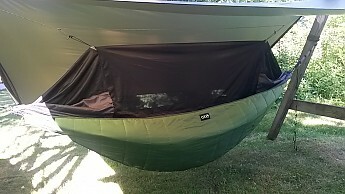 An underquilt hangs -below- the hammock and thus suffers no problems with compression or condensation. The loft is never compromised and is used to full effect. One can still use a sleeping pad with an underquilt for very cold conditions, but I did not find it to be necessary in above freezing conditions. The Ember 2 is rated for 50°F (10C°). I have used it in temperatures dipping into the mid-50's in conjunction with an unzipped rectangular lightweight Snugpak JungleBag as a top quilt. Wearing only a T-shirt and jeans I was very warm and comfortable with no drafts or cold spots evident. Unlike a mummy type sleeping bag, one has much more freedom of movement when using a hammock under and overquilt combination. Condensation was not an issue at all. I could easily see the combination of the ENO Ember 2 underquilt and the lightweight JungleBag performing comfortably down to about 40°F (5°C) while wearing minimal clothing. 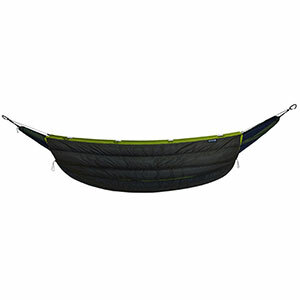 The ENO Ember 2 is polyester filled with a nylon fabric outer featuring ENO's DWR finish that is resistant to moisture and stains. 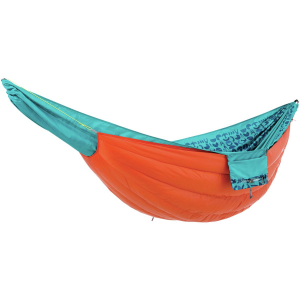 The Ember 2 features adjustable shock-corded loops on either end that quickly clip into your existing hammock caribeeners. Setup and takedown of the underquilt is almost instantaneous and doesn't require complicated adjustments. It is no chore to remove the underquilt during the day and to reinstall it at night when the temperature starts to dip. 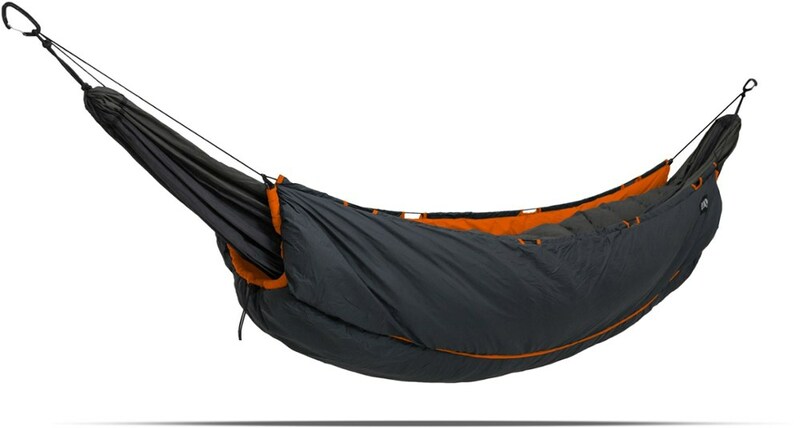 The Ember 2 is a perfect fit with my ENO JungleNest hammock and should fit most any other conventional modern camping hammock without any hassle. The ENO Ember 2 packs down to a cylinder 15" long by 8" diameter. It weighs a paltry 25 ounces (709 grams). Overall this product, after three outings, has performed flawlessly and I can highly recommend it! Thanks for sharing your review, John. The Ember Underquilt does what it's supposed to do. The Ember Underquilt does what it's supposed to do. It reduces the effects of cold temperatures on the underside of a hammock, due to the heat loss. It's designed to insulate the bottom and the sides of the hammock, helping to keep the hammock user warmer. Very effective in helping to ensure a warmer sleeping experience. Does not eliminate the need for a good quality sleeping bag or overquilt. I used the ENO Ember Underquilt on a recent trip, combined with an ENO DoubleNest hammock, Guardian Bug Net, and Dry Fly rainfly. My sleeping bag was a Mountain Hardwear Lamina +35. I slept in the hammock fully dressed, with a fleece jacket for extra warmth. I've learned the hard way that I have to plan on a hammock feeling up to 10 degrees F colder than when sleeping on the ground. That being said, the Ember Underquilt did its job, and kept me warm thoughout the night. The little thermometer I hung inside the hammock read about 35 degrees F when I woke up in the middle of the night. The one comfort issue I did experience was most my likely my own fault. I forgot to take off the socks I'd worn that day, before putting on my wool socks for sleeping, which meant my feet were a little damp, and got a bit cold at times. If, while laying on my back, I kept my feet side-by-side, they were fine. But if I crossed my legs, the foot on top got cold. I was able to remedy that by putting my wool cap over my feet. I honestly don't attribute that issue to the underquilt, and if I'd removed my hiking socks before putting on the wool socks, or if perhaps I'd have used a warmer sleeping bag, or a good quality overquilt, I wouldn't have had a problem. I've spent some pretty cold nights in hammocks in the past, and the Ember Underquilt now gives me the confidence to say that those times are behind me. The quality of the Ember appears to be quite good. The weight is not too bad, at just under two pounds. The stuff sack is actually a compression sack, which allows the underquilt to pack down fairly small, about 7 x 12 inches. I've read other reviews that complained about cold spots on the bottome corners of the Ember's squarish design, but I experienced none of that. We're all wired differently, of course. Someone else might find the Ember Underquilt quite adequate with minimal top insulation, but for me, I still need a decent sleeping bag to round out the package. Hammock camping hasn't proved to be any less complicated, bulky, or heavy than tent camping, for me anyway. But the dramatic increase in comfort levels, and the assurances of a better night's sleep justify getting the right gear for it. 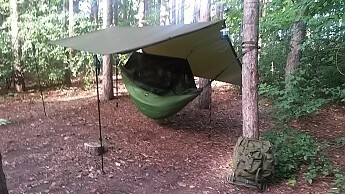 The ENO Ember Underquilt proved to be a worthwhile investment, and I'm very satisfied with its quality and performance. The Ember from ENO is awesome and I've gotten to use it quite a bit over the past 2 months. I've owned other underquilts that were cheaper but just didn't perform like I needed on a cold night in the mountains. So for this winter I decided to not let cost be the deciding factor for my next underquilt purchase. There were definitely more expensive underquilts, but I like Eagles Nest Outfitters as a company and know their products to be good quality. I think with the Ember you get what you pay for: an underquilt that is simple to set up but most importantly keeps you warm and dry. Most recently after getting almost a foot of snow a few days before, I went camping in Pisgah National Forest, one night the lowest temp was 26 degrees. While I was dressed warmly in fleece, no jacket though, the Ember kept me toasty and dry the entire night and the following two nights as well. Absolutely recommend this product.